The Turnitin Feedback Studio interface is scheduled to be released at Penn State on August 15, 2016. The new “Feedback Studio” interface in Turnitin allows instructors to view the Originality Report and GradeMark results at the same time as well as toggle filters for the Originality Report off and on. The report tools are also rearranged to be all displayed vertically as can be seen in the following image to the right. What’s different about Feedback Studio? The tools for the Originality Report and Grademark have been integrated into one vertical toolbar. Instructors can see all feedback from the Originality Report and Grademark at the same time or can toggle different options on and off. Instructors can click anywhere in the document to add a Quickmark or comment. What are the new features in Feedback Studio? Instructors can dynamically switch between different Originality Report filter settings. Grademark QuickMarks and comments can now be formatted with boldface or italics text. Instructors can include a link within a QuickMark or comment. All other functions outside the report, including course/assignment creation and student enrollment will remain the same. Will the students see a different interface? Yes, students will be able to see different types of feedback in one place (see image below) and will have the option to resize documents. 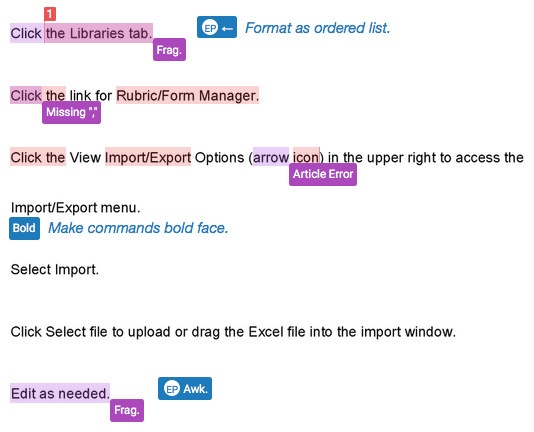 Students can learn more about the Feedback Studio from the Turnitin Guides. PeerMark is still available but has not been changed from the previous version and therefore still may have issues about paper distribution. You can read more about Turnitin PeerMark or consider using a Canvas Peer Review Assignment. Turnitin has made the following resources available.